Hello, everyone! I hope you’re all enjoying your day, and for those who are celebrating Christmas that you’re having a lovely Christmas Eve! I’m popping in quickly today to share a card that is quick and simple. It’s perfect for that last minute card you need, and I whipped it together in no time. I started by die cutting a stitched rectangle the size of an A2 size card from a piece of Penguin Palace’s Red Carpet card stock. This is a textured, heavy weight card stock that is the perfect red for Christmas cards-and I can’t wait to use it for Valentine’s day! Next I die cut some letters from the center in an arch. I die cut the word ‘merry’ and adhered the red piece of card stock to a card base. I made sure to save the inside pieces of the R’s to adhere as well. Next I took the stamp from the Spooky Halloween set that said “eat drink and be spooky” and did some masking so that spooky was cut off and instead it read “merry.” I love being able to use my stamps in a lot of different ways, and this was the perfect mash up! To finish it off I stamped and colored one of the sheep from Cuddly Sheep’s Season’s Greetings and fussy cut him out. I popped him onto the card with some foam tape and the card was complete! That’s it for my quick and simple card today! I hope you enjoyed it. Thanks so much for stopping by 🙂 I hope you’re all have a wonderful holiday season! Dare 2 B Artzy Card! Hello, everyone! 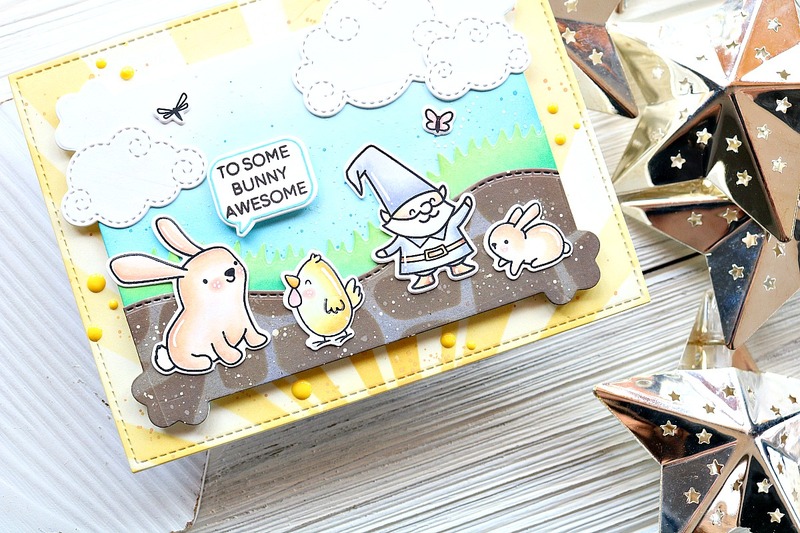 This month I have the amazing opportunity to be a guest designer for Dare 2B Artzy! I was so excited to get crafty with these stamps. I’ll have a couple cards to share with you this month using some of their beautiful products. Let’s jump right in to card one! For today’s card I went with a CAS card. 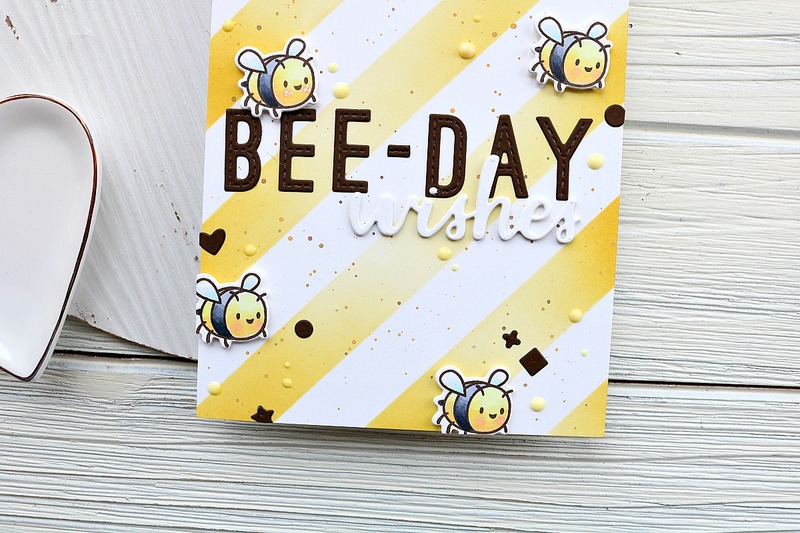 The bee from the Bee-utiful stamp set caught my attention, so I decided to create a patterned background with it. I stamped it using some Copic friendly ink and then colored each in with my Copic markers. Next, I die cut a stitched circle from the lower right side of the card so that I could have a window for my sentiment. On my card base I stamped the “happy everything” sentiment from the set with VersaMark ink and heat embossed it with gold embossing powder. I wanted the window to pop so I ink blended some Broken China Distress Ink over the embossed words. Finally, I put everything together! For a finishing touch I added some Crystal Nuvo drops in black and yellow and that finished my card. I hope you enjoyed the card for today. I don’t utilize the smaller stamps in a set as often as I should, and this is a reminder to do so! I love pattern backgrounds. Thanks so much for stopping by! I can’t wait to show you what else I have created for Dare 2B Artzy! Hi everyone! 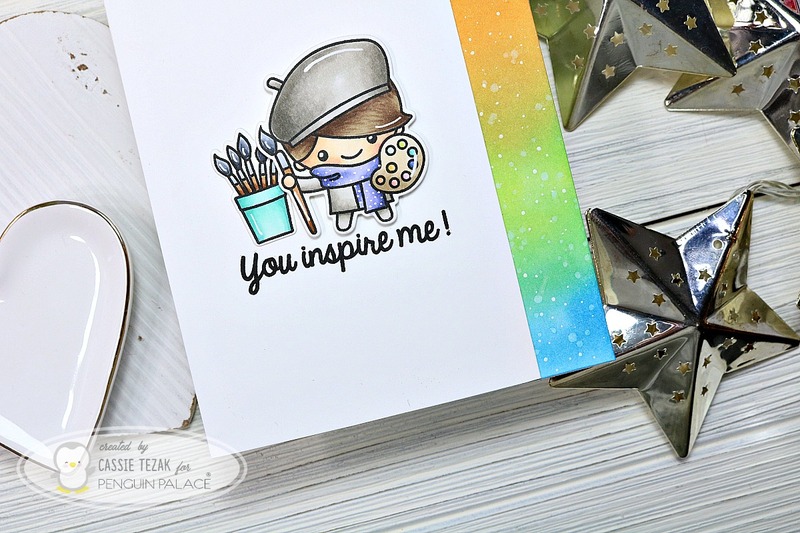 I’m popping quick today to share my project for the Your Next Stamp Challenge #98. Today’s challenge theme is “fall fun.” I was super excited to create with this theme because we’ve been having some fun fall weather this week and it’s got me in the mood for autumn crafts 🙂 Let’s take a look at the card I created. The new Autumn Harvest set was the first thing that came to mind for this challenge, so I used a couple images from the set to create this really clean and simple card! I hope you enjoyed the project for today. Be sure to head over to the Your Next Stamp blog and check out the rest of the amazing projects. Also, comment on the YNS post and play along with us for a chance to win some great goodies! Thanks so much for stopping by today. I’ll see you again soon with another card!